The Land Rover Defender. A loud, uncomfortable British SUV built twenty years ago and cancelled in America because they couldn’t afford to fit it with airbags. It’s unreliable, it has few amenities, it’s slow… and a nice one is worth $70,000. And a really nice one is worth $100,000. How the hell is this possible? To find out, I borrowed a 1997 Defender 90 from my friend David (Instagram: DavidTheCarGuy), who runs a dealership that specializes in automotive curiosities. And boy, is the Defender a curiosity. For instance: I am curious why they decided to fit several of the climate controls on the gauge cluster. Like usual, I created a video that details my findings. But I’ve also decided to write this column for those of you who are reading today from a workplace that does not allow noises, such as videos, or music, or human laughter. Now, let us begin. First, we must start with a little history. Although the Defender was sold in many countries around the world for several decades, it was only offered in America for four years. In 1993, we got 500 units of the long-wheelbase “110” model, all painted white and individually numbered, sort of like a collectible fountain pen. 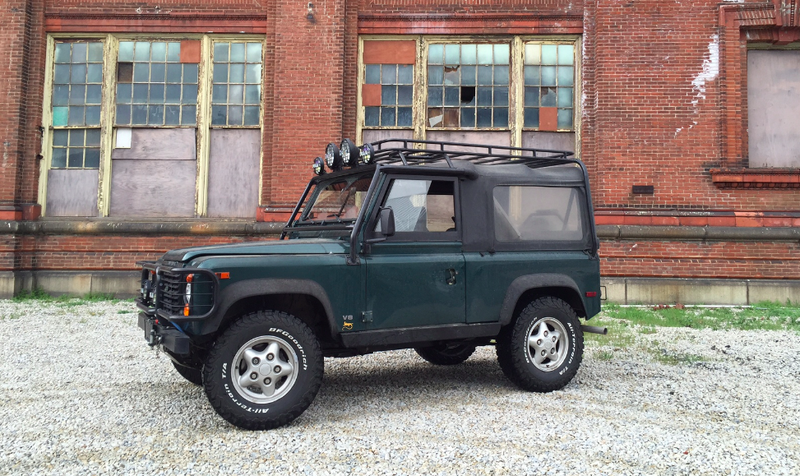 Then came the short-wheelbase Defender 90—the one I drove—which was available in 1994, 1995, and 1997. The Defender left the market before the 1998 model year, which is when the U.S. government mandated that all new cars must have front airbags. Land Rover decided they couldn’t afford this luxury, sort of like how they couldn’t afford to keep water from leaking into the Discovery through the interior dome light. This was awful timing. Five years on, Mercedes-Benz USA introduced the G-Wagen – similar to the Defender in many ways – and now, more than a decade later, Mercedes sells them for $150,000 a pop to people who carry dogs in their purse. This could’ve been Land Rover. Cool, utilitarian Defender. Cool, luxurious Range Rover. Cool, suburb-tackling LR4. Instead, they’re building a luxury version of the Murano CrossCabriolet. But even though the Defender doesn’t live on, its legend does. While many foreign market Defender models have been imported over the years, a true U.S. spec Defender still commands a premium for being the ultimate version to have. Indeed, the rustiest, rattiest U.S.-spec Defender, with no air conditioning and a Carfax that shows flood damage, hail damage, and long-term taxi use—a Defender that was used as a monkey storage facility and then parked in a barn for nine years before succumbing to uncontrolled lava flow up to its rocker panels—will still pull thirty grand. The nicest U.S. spec Defender in the world will easily get $100,000. So why the hell are they worth so much? It isn’t engine performance, I promise you that. All U.S. Defender models were fitted with a big, honkin’ V8 that made a whopping 182 horsepower. This figure is now exceeded by the Mazda3. And the Defender didn’t make up for it with a lot of torque: its 230 lb-ft figure is eclipsed by the nicest version of the Buick Verano. Back when the Defender was new, magazines said it did 0-to-60 in 12.5 seconds, which would make it an excellent contender for a drag race with a Nissan Leaf, or an early Toyota Prius, or a thunderstorm. It isn’t comfort, either. The Defender is loud, and rough, with poor visibility and little seat padding. It reminds me a lot of my Hummer, in the sense that whenever you go somewhere in either vehicle, you arrive at your destination and you think: Do I really have to drive this thing home again? And then there are the amenities. My God, the amenities. There are none. The Defender doesn’t have power windows. It doesn’t even have crank windows. The windows slide from side to side—and even when they’ve slid as much as possible, half the window opening is still covered. Air conditioning was an option. So was carpeting. There’s only one reverse light. There aren’t any anti-lock brakes. You want to get in the cargo area? First, you open the tailgate. Then, you open the rear window. With a zipper. If you don’t think any of this is crazy, consider the following: for the same one hundred grand you’d spend on a really nice Defender, you could get a brand-new S-Class. Imagine if you could only open the trunk of an S-Class with a zipper. So why the hell is the Defender worth so much? But the Defender justifies its price because of its unique look, its limited production, and the fact that anyone can buy a Wrangler—but only a limited few can get their hands on a “Land Rover jeep.” If you still don’t get it, I suspect you probably aren’t alone. I also suspect Defender owners don’t really care what you think.